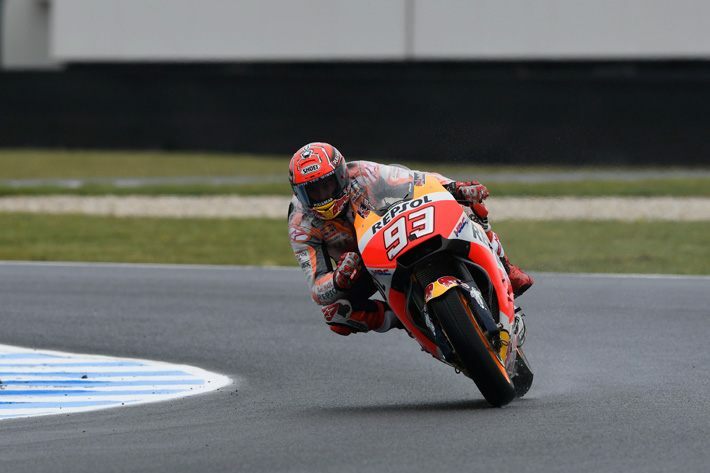 A dry qualifying session followed a wet practice earlier in the day at Phillip Island, Australia. Championship points leader Marc Marquez (Honda) took pole position for tomorrow’s race. Qualifying on the front row with Marquez were the Yamahas of Maverick Viñalez and Johann Zarco. The rider just 11 points behind Marquez in the title hunt, Andrea Dovizioso (Ducati), will start in 11th position (the fourth row) tomorrow. Typical for this circuit, weather has been a bit unpredictable and tomorrow’s race could be either wet or dry. You can find full qualifying results here. Stay tuned for further race coverage on MD. Marquez had time to screw with everyone looking for a tow, then went out and set pole. He may be the only true alien out there. A KTM ahead of Rossi. Prost! An Aprilia up there, too! Times, they are a’ changing. …unfortunately having (most unceremoniously) taken a digger in qualifying on the brakes into MG.